Is this Morrisons' new logo? Could this be Morrisons' new logo? 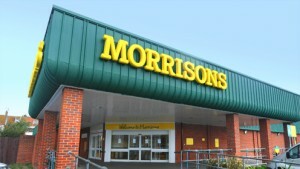 The Bradford-based retailer has registered seven variations of a new logo design with the Intellectual Property Office, all of which include a "friendlier" lower case typeface and reference its heritage with the words "Morrisons since 1899". The new logo was actually trialled last month at its relaunched Merrion Centre store in Leeds, though at the time Morrisons said there were no plans to roll it out. A Morrisons spokeswoman would only say it was "constantly listening to customers to ensure that we reflect both their changing needs and what makes Morrisons better and different". Morrisons has introduced a number of changes since David Potts replaced Dalton Phillips as CEO in January, including dropping Ant & Dec from its TV ad campaigns and reintroducing staffed express checkouts to its stores. It's also sold off 140 M Local convenience stores to private investors. Rival Asda has recently rolled out its own rebrand, redesigning its green and white logo to share the yellow spark of its parent company Walmart.